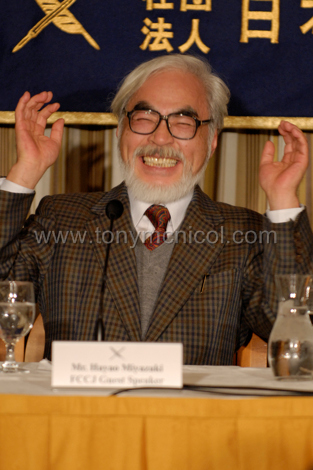 The anime director and genius Hayao Miyazaki came to the Foreign Correspondent’s Club in Tokyo yesterday for a press conference. I was there with the rest of a horde of snappers. (Miyazaki is a bit of a recluse, so not many chances to get pictures of him). But when he talks to the press, he really talks!. He’s famously left-wing and anti-war. Yesterday he took the opportunity to lay into Japan’s rightist PM Taro Aso . Miyazaki said it was “embarrassing” that Aso is a manga fan. Quite. This pic was taken before the conference. He looks just like you’d expect. All tweedy and grandfatherly. 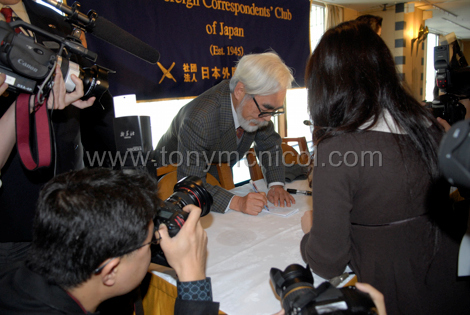 Miyazaki spent about 90 minutes talking to a packed room then another 20 minutes signing autographs. Looked exhausting. No wonder he doesn’t do many press conferences. This entry was posted on Friday, November 21st, 2008 at 10:35 am. It is filed under manga, my photos and tagged with ainme, FCCJ. You can follow any responses to this entry through the RSS 2.0 feed. I’m not an anime fan but I love the last shot that you present of Miyazaki – he really looked as if he was enjoying himself. Thanks Shane. As they say in Japanese, he was really “mujakki”, innnocent. E’ una persona che dice cose molto interessanti. Oh no, he was doing autographs… That makes me even more regretful I was in Seoul. At least I got to read your blog though. Yeah, there were hardened hacks queuing up with DVDs in hand to get them signed for their sons and daughters. Do you speak Italian. I’d love to know what Debris said? !